WOW!! It has been months since I posted here!!! I have a confession to make....I didn't pick up my HAED all summer long!!! Isn't that just terrible of me??? I finally started stitching on it again this past Friday and instead of doing the blue which is a really quick stitch...No, I started another dreaded tree!! It is coming along nicely!! I am going to start working on this once a week again...that is my goal for the rest of the year. I hope everyone is doing well...and I have alot of back posts to go through!!! This month, I'm giving away one of my very favorite tools!! The DMC Needlework Threads Color Card. If you don't have a color or want to change a color, this is a very good tool! It's also great for helping you decide if you want to go up or down a shade. It does not come with floss samples, like the old cards did. It groups color lines together. All of the colors lines in DMC...satin, pearl, six strand, variegated. I use mine a lot!! Last month one of our members suggested magazines...so I went to our local book store and got what they had! I wish they carried more;) The Christmas Ornament Preview Issue from Just Cross Stitch (July/August 2009), Stoney Creek Cross Stitch (June 2009) and Cross Stitch Gold (June 2009). Unfortunately, I did not get a lot stitched since the last picture. It was so hot here in Germany and my appartement is right under the roof. Some evenings it was just to hot to stitch. The other evenings when I could stitch I had to stitch for two friendship samplers that I signed up to stitch for. So, here is the picture. As the weather gets cooler, I will be able to stitch more. I love what you are doing with your projects and really enjoy seeing your progress pictures. I finished another of the Tiny treasures- pat a cake. My son is moving 1900+ miles, coming here first for jeep repairs and hugs. 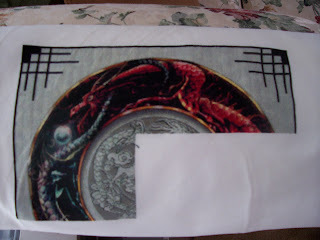 Here's my latest update on Dragon Knot. Life has been getting in the way lately of making significant progress! So slow is the pace for now! Here's my progress for the week. It doesn't yet amount to anything and now I've found three new patterns that I like! It's hopeless. I'm well on my way to the world's largest collection of WIPs and serial starts. So sad...I can't commit! Happy stitching to all of you this week! I love to see all of your progress, even if it is intimidating at times! LOL! Sorry that it took two weeks for an update. But very hot weather, sick (again) and much work. But I have this morning finalized the Firefly. Finally finished so I can go to the Madonna of Christensen. Everyone has a lot of progress. Great. all a good stitching week. Page 5 is progressing, and still at least 4 pages left to do with only those 4 stupid colors. I don't like it anymore. 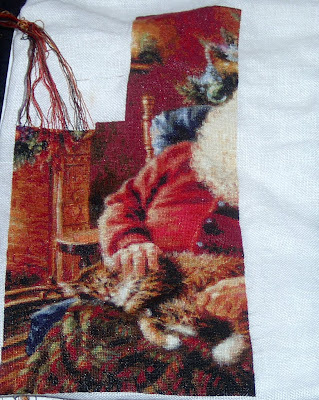 There are over 80 colors in this work, but all I stitch is 4. I start to think that the other colors are in it with only 1-2 stitches. I love this design and the more I have to work ......the more I enjoy them ! The very very many confetty stitches are not so difficult ( no longer)and it's varied work! Soon I am on the lower part of the pattern and then almost to page 3! It is a shame that so slow moving forward, I know it's not a competition but I've already seen so much that I find very beautiful and I would like to make! But time is simply not for sale! I always enjoy your progress and beautiful designs, great job!!! a very nice weekend all! but I didn't do any stitching on my HAED last week. I really hope I can catch up next week. We have been very busy here with our store and I have just finished a felt balloon, for which we will give a workshop of it. I can't wait to pick up my HAED again. In the meantime I did enjoy all of your progresses!! Keep up the good work, you guys rock! Wishing you all a wonderful weekend with lots of stitching fun. I was so excited to see Linda Ravenscroft's Mystic Mogs charted by HAED! I got them all. I have no self control. I started Arthur over the weekend. It's not that exciting looking, as I started in the upper left corner. It's all background so far. Stats: 32 ct. Zweigart Belfast Linen, Olive Green. Full cross 1 X 1. Belfast isn't my favorite, but it was the perfect size and I liked the contrast from the backround of the chart to the fabric. The background is a lot of creamy, peachy, yellowy floss, and I thought it would be too hard to see where I stitched and where I didn't if I went with a more netural color. I can always run the matt right up to the edge of the stitching later on if I don't like the look of the fabby. It isn't a dark color, it's soft and light, not like you would think of an Olive Green. This is the first HAED I am attempting on 32 ct. Everything else is on 28 ct. What do you think? Does it look okay? It's soothing, just stitching a lot of one color for a while. It's a contrast to other projects with a lot of detail stitching. I'm going to try to work my way (cross country) down to his ears. Get some of the detail stitches going, then I'll have a reference point to work over to where there is less detal stitching on the other side. That way I can work on either a lot of detail, or not, depending on my mood. Plus getting used to the 32 ct. doing a lot of one color is helpful. I haven't been leaving comments, but I do want to tell you all that your work is beautiful! 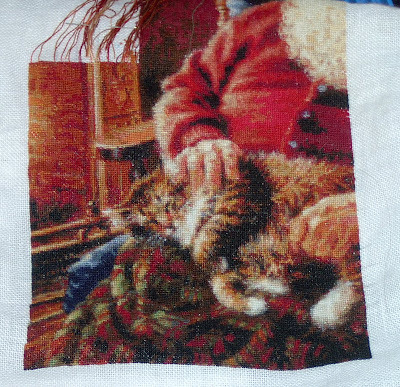 Thanks for sharing all your gorgeous stitching! I finally finished page 3 yesterday. I'm working longer hours now and it is cutting into my stitiching time! However, more money for more stash. Well, let's get to why we all come here. Here it is with a little lap over onto page 4. 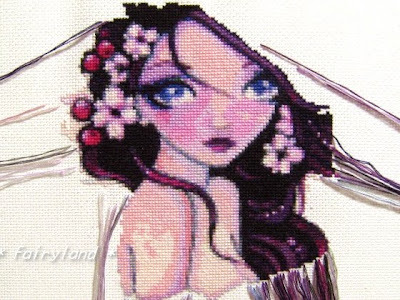 Have a good stitching weekend! Here's my SAL pics of St Nick in His Study. That 'green stuff' behind Santa's head is the beginnings of his chair. Love this pattern. Have a wonderful week-end everyone! I have not stitched on my HAED (Beneath the Brooklyn Bridge) this week due to the tendonitis in my right arm, which flares up from time to time. Also my hands are hurting due to the fact that I had to archive a year worth of files at the temporary assignment I am currently on. So I must take this small break from stitching and knitting :( I plan to pick up my needles this weekend since I have rested my hands and arm this week. You all are doing wonderful stitching and making great progress. I love looking at everyones' HAEDs; you all keep me motivated!! Hope you are having a great week of stitching. I stitch and stitch and don't seem to make much progress. 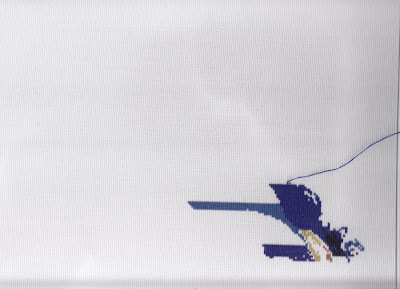 But that is the nature of this beast that we call counted cross stitch. My little panda is coming along pretty good, I am anxious to share her with you. O.K. I know that I am sexist because I call the little one she. Hope everyone has a great week of stitching, stitching, stitching. After some turbulences, the sky is clearing and the travel continues. We hope that you enjoy the flight with the Winter Angel airline. We are getting near our next destination, which is the island of the Second Raw. Here is my update - a little early this week as I will be away tomorrow. I have finished off my monthly goal for her. She is such a fun bright stitch and it is always a joy to work on her. Three photos at once, I do stitch a lot, but I can hardly manage to blog, I'm really bad... I’m 34 weeks pregnant now and it feels like I’m tired all the time. I almost finished the second page of Waterlily Mermaid, but I was short of two colours. I ordered them, but only this morning they arrived by mail, over three weeks after ordering! It's becoming beautiful, but to be honest, I think this work is a bit small with only four pages. The wizard of Oz is fun to stitch. I have a part of Tinman now and the but of lion. It doesn't stitch quicky, but that doesn't matter. And within a week I stitched the second page of Impossible love. Compared to The wizard of Oz this is quite simple, only little colour changes. I'm looking forward to something else than sky, but of course the clouds are beautiful as well. 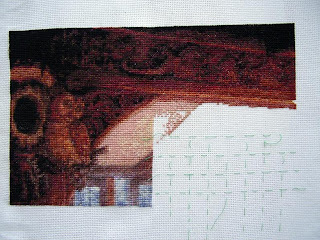 At the right of the picture I can stitch the wings of the angels. I love the colours, don't you? 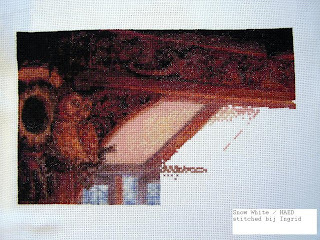 I still enjoy reading this blog very much, it's nice to work on this kind of stitch work all together. In my own environment I don't know people who stitch as much as I do, most people admire it, but don't understand it. It's great to meet people who like it so much as well! I made several MAJOR counting errors on Summer in Bavaria - to the point that I had to quit. I was so sad, I wanted to stop, just cry and then throw some things...which I did some of that, lol! I want to thank you all, and Cindy in particular, for encouraging me not to stop. Your work was my inspiration - and I didn't want to quit stitching anyway - just had to quit being mean to myself for being such a nut! 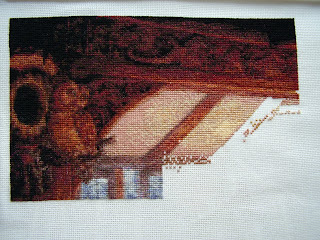 I've decided to start on Oriental Landscape soon - have the threads but just can't work up yet to putting the material back on the bars. Also have chosen Abundance of Joy for my birthday club choice. I may someday go back to Summer in Bavaria - but not anytime soon, lol! Hope you all have a wonderful week and thank you for not giving up on me so I wouldn't give up on myself! It's been a long, long time since I have posted or commented and I apologize to everyone! I fell off the HAED wagon and then I think it ran over me 3 or 4 times! After binging on stitching HAEDs only for a few months, all of a sudden I had to work on my forgotten Cirque de Circles, Salem Sisters, and I started the Monopoly board. Too much of a good thing isn't necessarily good! Going from the HAED to the Monopoly board was a tactile experience like no other. The 14 ct Aida felt like burlap and the needle is as big as a nail! 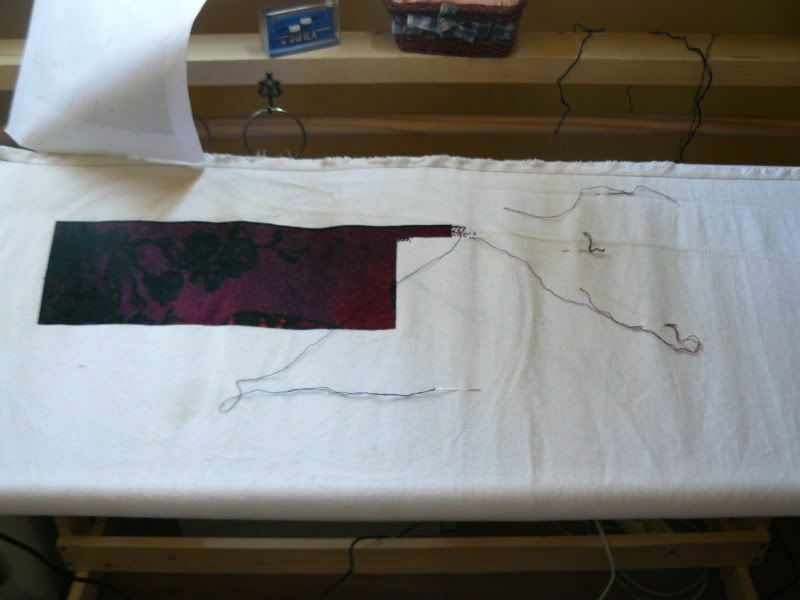 I felt like I was working on the "Tonka Toy" of stitching projects. Belated congrats to all who had finishes!!!! That must feel awesome! The rest of your progress I will catch up on. Here is an updated picture of Leaf. My goal is to stitch 1/2 a page a month. Last week I managed 1,400 stitches and am on the last row of my goal. You can see the hint of red on the side which are the start of her lips. I can't wait to get to page 12 and to get her lips done. Here she is, after 2 wks solid stitching. She's been a joy, even with all the color changes!!! I really need to get to work on some fall stitching, but find it hard to put down my HAEDs. She's 1 over1 on 28ct clay overdye, not doing the background outside of the oval. Wahooo!! 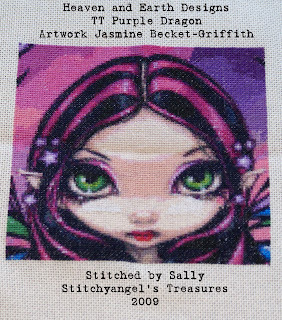 I am happy dancing here as my TT Purple Dragon is finished and here she is!!! This is a small update from my Queen of Hearts. It's on my brandnew, selfmade stitching standard. I still have to get used to work in, but I hope that ends soon. At the moment stitching on it gives me pain in my back, neck and arms. It took us a bit of time to make, but eventually, it will be allright. If you want to see more pics of the standard, I'm not bottering you with it here, but go check on my blog later this evening. It has been a while since I showed my progress, but here is my update. 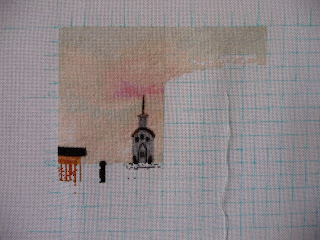 I have been stitching on Thursday as well. I don't have a before picture now. As you can see, there is some more of the palace now. I still enjoy stitching it. I haven't been commenting a lot last week, but this is because I just got back from vacation, and then there is a lot of work to do at home too. But I'll try to catch up. I know it has been ages since I posted. I have been stitching lots though. I have set myself a goal to stitch 1/2 page on Leaf and Crabby Crush QS every month. So far I have been able to meet the goals. I have been working on Blue Pearls Mermaid QS which is in my 10 hrs rotation. There has been lots of blocks of 3685 and I will be glad to see a bit of confetti stitching. Due to family circumstances there wasn't much time lately to stitch on my HAED. I took it only once with me. 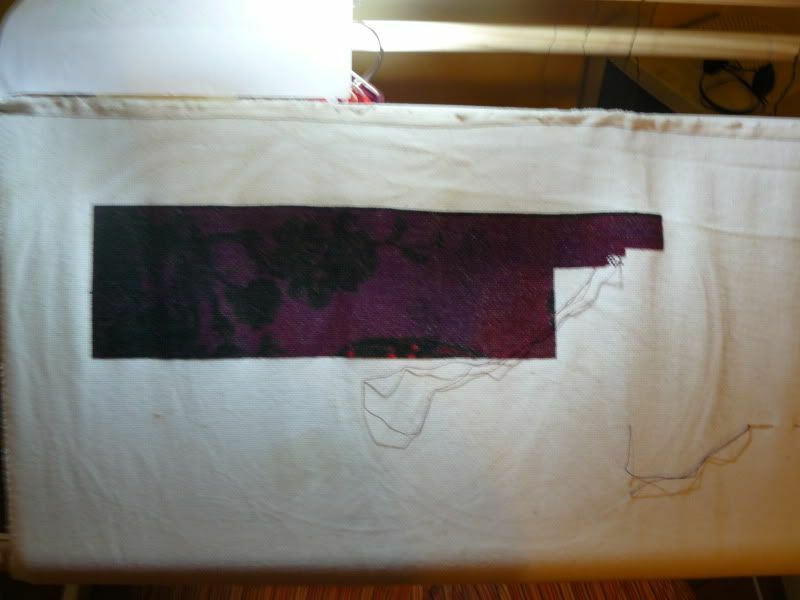 Still loving stitching this chart and hopefully I will soon have more time to put more stitches in it. I am almost done with page 3. I have most of one column and four rows to go. I already have some overlap onto page 4. I hope to have it done by next week. Hello everyone, I just let you see what I embroidered this week on snow white ..... it is always a small piece that it is almost not worth to show! It is also such a great job and I can for the moment do no more than two hundred stitches per week, because as a work of years, I must rotate so that it is not boring! I'm already very much like the many confetty stitches ...... because they make the work very nicely! I will be happy if I once again a page of the pattern have finished! The good news is I got a super new computer -- the bad news is it didn't want to connect to the internet. I've been trying to get this posted since Thursday night but my internet connection kept dieing out, very weird. And don't we all just love those "technical help" people, right! But I think the problem is, if not solved, at least temporarily fixed. So the better news is I have some pretty good progress this week on Dreams of Atlantis. I'm very happy with what I've accomplished since my last post (about 1900 stitches) especially since I had at least three days of no stitching at all. I really enjoyed my visit over the blog today. There are so many stunning pieces on display. Way to go stitchers! Keep those needles burning! And thanks for looking. My Blog, home of the Totally Useless SAL, come on over and join the fun.